Are you looking for a stock? Pattie Lovett-Reid: Are you worried about the costs of living longer? Personal Investor: Anyone can be a financial advisor. Really. In the Sichuan city of Chengdu, Chinese rocket scientists are planning to suspend a man-made moon bright enough to reduce the need for streetlamps. It’s exactly that kind of ingenuity that has helped the world’s most populous nation churn out new billionaires at a prodigious clip, according to John Mathews, head of ultra-high net worth in the Americas for UBS Group AG. 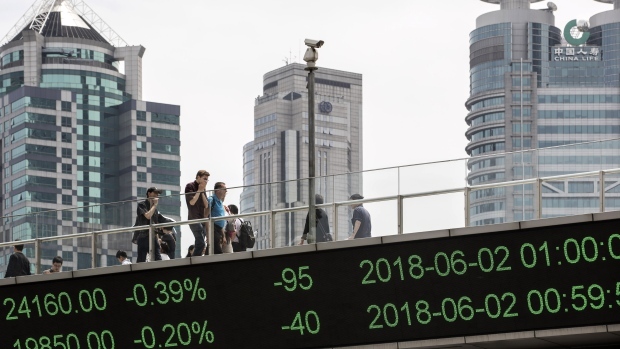 The combined wealth of China’s billionaires surged 39 per cent to US$1.12 trillion last year, as the nation’s buoyant markets generated two billionaires a week on average, according to Friday’s Billionaires Report from UBS and PricewaterhouseCoopers LLP. That’s more than double the gains reaped by their peers in the U.S. and Europe, whose collective fortunes increased 12 per cent and 19 per cent, respectively. The report tracks 2,158 individual billionaires across 43 countries and shows that their combined wealth increased 19 percent to a record US$8.9 trillion. A burgeoning tech industry and startup culture that’s poised to challenge Silicon Valley has been the engine for much of China’s wealth creation, according to the report, which noted that China produced almost three times as many self-made billionaires as the U.S. last year. Yet some of the wealth gains may be illusory. Roughly half of China’s new billionaires saw their wealth dip below 10 digits by the end of the year, the report showed. And the sudden swings between wealth accumulation and destruction continued into 2018. Fortunes, many tied to public markets, have been buffeted by more volatile equity markets. 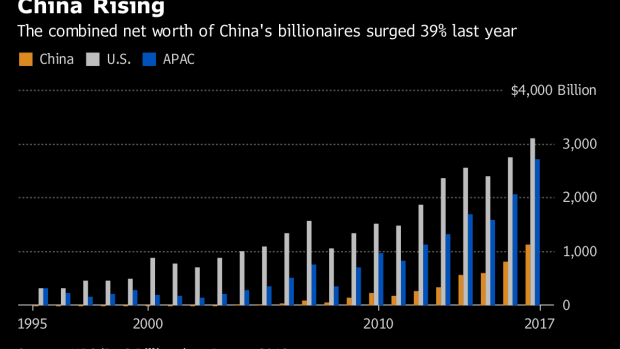 Among the 16 billionaires minted in China earlier this year, about a quarter of them lost that status by the end of trading Thursday, according to data compiled by Bloomberg. China’s 36-richest people have lost 19 per cent of their wealth, or US$83.8 billion, so far this year, according to the Bloomberg Billionaires Index, more than any other country represented on the ranking of the world’s 500 biggest individual fortunes. --With assistance from Venus Feng and Pei Yi Mak.